In remembrance of John F. Kennedy, the Schiller Institute Chorus presented Mozart’s Requiem in its entirety on January 19, 2014, to an audience of 1,200 at Boston’s Cathedral of the Holy Cross, exactly 50 years to the day of the Solemn High Requiem Mass for President Kennedy celebrated by Cardinal Cushing in the same cathedral. "Classical musical composition serves as a hallowed spiritual retreat from confusion, into the domain of the most concentrated sense of truth and beauty, from which we reemerge always strengthened in our powers to exert that quality of creative reason by means of which Genesis 1:26-30 sets mankind apart from all other creatures in this universe. Thus, virtually all truly great scientists must rely upon such music, that their moral character might be more fully developed in keeping with their vocation." Ever since first hearing a recorded musical performance by the legendary conductor Wilhelm Furtwängler immediately after the conclusion of WWII, Lyndon LaRouche has been a fervent devotee of what he identifies as the Promethean spirit of creativity embodied by the greatest classical composers and artists. LaRouche’s passion for the defense and revival of the genius expressed in the unique capability of musicians such as Furtwangler to perform ‘between the notes’ and carry the listener to a sacred place beyond mere sense experience, has brought him into contact with some of the most celebrated artists of the past century, such as Norbert Brainin, the principal violinist of the great Amadeus Quartet, with whom LaRouche became close friends. Consistent with LaRouche’s insistence that there is no division between art and science, he has also led the campaign to standardize musical tuning at the ‘Verdi tuning’ of C=256 Hz, a campaign which has found overwhelming support from among the most accomplished opera singers of our time, including Luciano Pavarotti and Piero Cappucilli. LAROUCHE AND THE CLASSICAL METHOD IN SCIENCE AND ART? — Lyndon LaRouche, "Behind The Notes"
"There are many conductors, but very few of them seem to reveal that secret chapel that lies at the very heart of all masterpieces. Beyond the notes, there are visions, and beyond those visions, there is this invisible and silent chapel, where an inner music plays, the music of our soul, whose echoes are but pale shadows. That was the genius of Furtwängler because he approached every work like a pilgrim who strives to experience this state of being that reminds us of Creation." "The essential, practical question is expressed by the words: What is the shadow cast, as distinct from what is actually the ostensibly unseen, ‘but actually efficient’ substance? What is the unseen reality which appears to our sense-perception as the pseudo-substance, ‘the mere shadow’ of experienced sense-perception? Are human sense-perceptions real? Are they, essentially, “real shadows” of the unseen? "... The actual effect of what has often been considered “elementary” reliance on sense-perception, creates the fatal folly of mistaking a man’s mere shadow for his actual self. The indicated remedy for that error has been implicitly provided by the combined role of respectively “the nearly heard” and “the distant heard” of the great argument by Wilhelm Furtwängler." — Lyndon LaRouche, "A Lesson From Furtwängler"
The first in a series of three pedagogical discussions addressing the implications of "The Furtwängler Principle" in science and art, which accompanied LaRouche's paper "A Lesson From Furtwängler." LaRouche’s passion for the defense and revival of the classical principle embodied by such performers as Furtwängler, brought him into contact with the most celebrated artists of his generation with whom he formed very close bonds and friendships. Included among these were William Warfield, Sylvia Olden Lee, and Robert McFerrin, pioneers among African-American opera singers in the United States, who joined LaRouche in a campaign he initiated to found a National Conservatory of Music in the United States. Perhaps most significantly, Lyndon LaRouche maintained a decades-long friendship and collaboration with the great violinist Norbert Brainin, premarius of the celebrated Amadeus Quartet, which began in the 1970s, when Brainin received a copy of LaRouche’s writing, “The Florestan Principle in Art” while in New York City, and continued until the time of Brainin’s death in 2005. Brainin’s own insight into the science behind classical musical composition was reflected in dialogues which he engaged in with LaRouche on the subject of Motivführung, or motivic thorough-composition, as the secret to unlocking the principle behind the late Beethoven string quartets. The implications of this concept would be developed by LaRouche in some of his most significant writings on music, such as “Mozart's 1782-1786 Revolution in Music,” “The Classical Principle in Art and Science,” “The Substance of Morality,” and numerous others. Norbert Brainin during a masterclass in Slovakia states that the shared understanding between him and Lyndon LaRouche of the "Motivführung" principle in music established "the bond between us." [The idea of] Motivführung is close to my heart; I've carried it around with me for a long time, and it never really resonated with anyone else; and the only person who immediately understood it, was Lyndon LaRouche, and that is the bond between us. Norbert Brainin and pianist Günter Ludwig presented a concert in Munich on December 12, 1988 at the tuning of C=256, featuring Schumann, Beethoven, and J.S. Bach. This was one concert in an international series. Led by the international Schiller Institute, LaRouche’s initiative took the form of a campaign for legislation which would lower the standard tuning pitch of orchestras internationally down from the arbitrarily high pitches currently adopted in concert halls of A=440 and upwards, back to the natural “Verdi tuning” of A=432, or the corresponding C=256. A petition was circulated by the Schiller Institute in support of the initiative, which was signed by many of the most prominent singers and musicians in the world, including Luciano Pavarotti, Piero Capucilli, Dietrich Fischer-Dieskau, Mirella Freni, and many others. Seminars on the scientific and artistic superiority of the natural pitch were held in Italy, Germany and the United States, with singing demonstrations by the world’s best opera singers and other musicians. In 1988, in collaboration with the Schiller Institute, legislation was introduced for consideration by the Italian Parliament which would mandate such a standard pitch within Italy. Piero Cappuccilli demonstrates the superiority of the Verdi tuning at a conference hosted by the Schiller Institute on April 9, 1988 at the Casa Verdi in Milan, Italy, which brought together some of the world's most highly-regarded Classical singers and instrumentalists, to demand a return to an international tuning standard of C=256, or A=432. Honorable Senators: In recent weeks, we have been called upon to find a lasting solution to the continuing uncertainty and variability in the basic pitch of musical instruments, which is revealed as harmful and dangerous not only for singers' voices, but also for our instrumental patrimony, and in particular, for the antique string and keyboard instruments (violins, violas, violoncellos, not to mention organs and fortepianos constructed for a tuning not above a concert A between 427 and 435 cycles per second). The "race to the high pitch" which we have witnessed for decades, justified by some with an erroneous interpretation of the concept of "artistic liberty" which itself threatens such liberty, rendering artistic expression impossible, and which has brought us to distortions such as the stratospheric tuning of some opera houses (Vienna, Berlin, Florence, Dresden), which risks making it impossible to correctly interpret masterpieces such as the symphonies of Mozart, Haydn, and Beethoven, and could, according to the testimony of famous operatic performers and orchestra conductors cited in this report, bring us to a situation in which, within a few years, it will not be possible to stage numerous lyric operas, due to the lack of voices suited to the repertoire. The standardization of the tuning of musical performances at the lawful pitch of C=256 is far from an academic issue; rather, it is one of scientific and artistic rigor, and one without which the ability of civilization to maintain the health of the singing voices and instruments capable of performing great music are put very much in jeopardy. This is the reason that LaRouche’s call was met with such powerful resonance from so many great artists and other leaders. Since France has adopted a standard pitch, I advised that the example should also be followed by us; and I formally requested that the orchestras of various cities of Italy, among them that of the Scala [Milan], to lower the tuning fork to conform to the standard French one. If the musical commission instituted by our government believes, for mathematical exigencies, that we should reduce the 435 vibrations of French tuning fork to 432, the difference is so small, almost imperceptible to the ear, that I associate myself most willingly with this. It would be a grave, extremely grave error, to adopt, as proposed from Rome, a standard pitch of 450!!! I also am of the opinion with you that the lowering of the tuning in no way takes away the sonority or liveliness of the execution; but gives on the contrary, something more noble, of greater fullness and majesty that the shrieks a too high tuning fork could give. For my part, I would like a single tuning to be adopted in the whole musical world. The musical language is universal: Why then would the note which has the name ‘A’ in Paris or Milan have to become a B-flat in Rome? One of the first (unofficial) standardizations of an elevated tuning pitch took hold over half a century before Verdi’s efforts, following the 1815 Congress of Vienna, at which Europe was once again divided up among the empires following the disaster of the Napoleonic Wars. The set of band instruments given to the Austrian military band by Tsar Alexander of Russia at the Congress were tuned at the high pitch of A=440, setting off a craze across Europe to replicate this new, much more brilliant sound. Pitches across the continent began rising from the much lower A=426-435, to A=440-50 and higher. Only a few decades after Verdi’s fight in Italy for a lower pitch in the 1880s, another attempt came, during the rise of fascism in Europe, to standardize international tuning pitch at A=440. At the request of Radio Berlin, under the oversight of Josef Goebbels, the British Standard Association held a conference in London in the Spring of 1939 at which they attempted to establish the standard international pitch at the German A=440. With the outbreak of war, this decree did not take hold, though in the post-war period, London meetings of the International Standardization Organization, beginning in 1953, have continued to claim A=440 as the standard international pitch. Still in places like the United States in this period, C=256 was recognized as the natural pitch, as seen in the 1944 U.S. Army Manual, which notes that at the elevated pitch, "sopranos find it difficult to sing music written by Handel and his contemporaries." 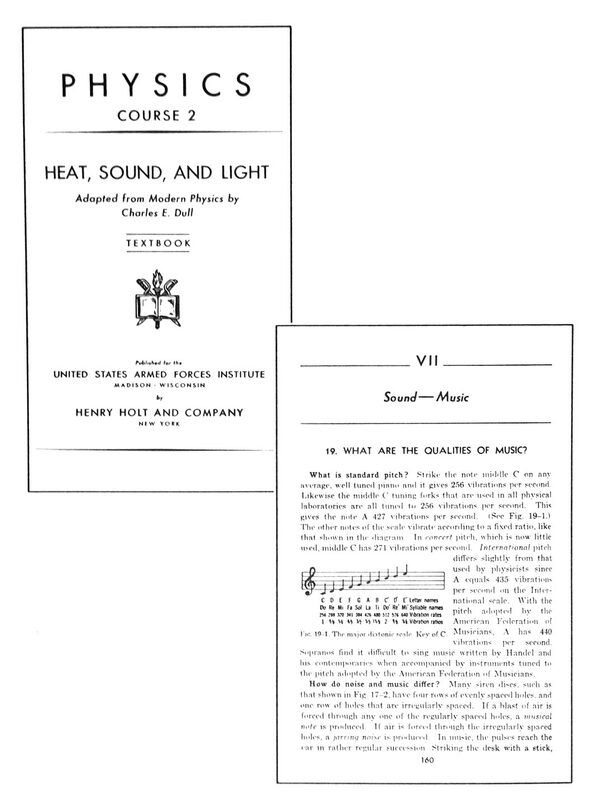 The 1944 Manual of the U.S. Army inisists on C=256 as the standard pitch, and notes that "sopranos find it difficult to sing music written by Handel and his contemporaries when accompanied by instruments tuned to the A=440Hz pitch adoped by the American Federation of Musicians." The wild fluctuation of tuning pitch from city to city and from year to year which would necessitate such a fight over standardization, arose from a much deeper epistemological battle surrounding the nature and purpose of art itself. Is art based in the senses? Is it merely an expression of the feeling of the moment, or the portrayal in sound of events in the “outside” world? At the elevated tunings, instruments which were originally built for a lower tuning (particularly in the string sections of orchestras), produce a much more brilliant sound, with a greater physical effect on the listener. This sound was particularly demanded by the music of such as Giacomo Puccini, Igor Stravinsky, Richard Strauss and Richard Wagner, whose music relies on the momentary emotional effect of the intensity of the sound itself. But is music merely the effect of sound? The classical tradition associated with Verdi, Brahms, Beethoven and Bach delves deeply into the poetic principle of irony, seeking to move not the senses, but the mind of the listener with a higher, inaudible idea. This is the tradition in art which first gripped LaRouche as a young man, and which he demanded be saved with a lowering of the tuning back to C=256. "The specific excitement of creative work, otherwise found in great music and insightful forms of wrenching humor, is a specific sort of surprise. Laughter: the quality of the creative experience, of music, of wrenching insightful humor, and exciting moments of loving." "A population which lacks enjoyment of great art, great music most emphatically, is not only culturally impaired in the ordinary sense of that term, but is deprived of a means for improvements in its qualities of moral judgment and creativity in general." "The human race needs Beethoven's music. He expresses and celebrates that which uniquely distinguishes man from lower beasts... In the deepest sense, Beethoven's music is political. It is the musical 'political literature' of Promethean humanism." "The characteristic feature of the 1781-1782 Haydn-Mozart revolution, is the successful development of a principled new conceptual approach to Classical composition, an approach by means of which a complete work might achieve that singular perfection of unity of effect which is the subject of Plato's Parmenides dialogue on the matter of the One and the Many." "Classical Aesthetics is centered around strict definitions of what ought to be intended by use of the terms 'natural beauty' and 'artistic beauty'... Artistic beauty is the essence of that which sets mankind apart from, and above, the beasts... This locates the source of artistic beauty in those same potential creative powers of the mind which account for mankind’s ability to generate and to assimilate efficiently valid fundamental discoveries in physical science." LaRouche's keynote to the conference for a Marian Anderson National Conservatory Movement on May 28, 1994: "We require a form of society, a form of relationship among human beings, which recognizes that we're all brothers and sisters, as children, in the image of God." "If the unchanging idea of the perfected composition, must govern the performance in progress, from beginning to end, can not the idea of this relationship inspire the composer to improve the method of composition accordingly? Should the idea of the composition as a perfected whole, not guide the composer in his building the composition, step by step? Thus, to achieve a less imperfect coherence, in the process of composition itself, must we not desire, that the idea of the perfected composition should be an implication of some simple germ, from which the composition as a whole unfolds?" "The writer learned of the phrase which Furtwängler employed: performing between the notes. Since first hearing Furtwängler's conducting, that experience has dominated this writer's relationship to music, in the most compelling fashion and degree... This writer devoted a significant ration of his time to exploring the mystery: What was Furtwängler's secret?" "Scientific and technological progress, as such, are indispensable for the continued progress of the entirety of our species. However, when and whether progress, or even retrogression occurs, is never automatic; the actual outcome is a result of what we term 'cultural factors." Our task is to lead the reader into a breakthrough in recognizing, from the example of music, the nature of the ontological principle involved in Classical culture as a whole." "No great discoveries of universal principles, either in science or art, could ever be conveyed by formal logic, or any other symbolic mechanism. Discoveries of validatable qualities of universal principles, whether in science or art, can be conveyed only in the same way the original discoveries were generated: by cognition, an act of cognition which occurs entirely within the sovereign creative powers of the individual human mind. The audience for that discovery can capture that idea only by re-enacting the original discovery." "The fact of the rich development of the mind of a Helen Keller should have reminded any thoughtful person, that it is only the human mind itself, which is the seat of knowledge respecting practicable knowledge of the world which surrounds us, even when we can reach that mind which is imprisoned within a place without sight or hearing, only by indirect means."